Formulated to help support healthy joints. 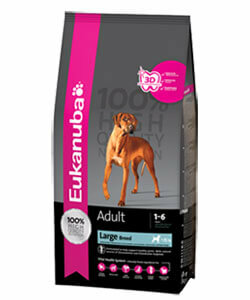 With natural sources of Glucosamine and Chondroitin Sulphate, Eukanuba Adult Large Breed provides optimal nutrition for large breed (25-40kg) and giant breed (>40kg) adult dogs. Formulated to help support healthy joints with a reduced fat level to help maintain optimal weight for minimised joint stress as well as natural sources of Glucosamine and Chondroitin Sulphate to promote cartilage health. It contains high quality animal based protein (chicken is our No1 ingredient), fat, carbohydrates, fibres and important vitamins and minerals for the health and well-being of your large and giant breed adult dogs.